Scubasigns 101 with the locals! I am in Nepal! Barely did I have time to update on Pulau Weh, and now I’m on another trip again. Was home for only 2 days after the diving trip, which gave me just enough time to unpack my island-life clothes, and then start over with packing items that’s more fitting for the winter. I’m on this trip with my dad, and we actually flew in to Kathmandu on the 30th of October. I didn’t bring my computer with me which sorts of limits my chances to update the blog. I am, however, writing drafts of posts on my iPad, so perhaps later today when I get the chance I’ll locate a free Wi-Fi spot and sync the updates for the last few days. Tags: Everest, Everest Base Camp, Family, Father-Daughter Trips, Hiking, Kathmandu, Nepal, Travel, Trekking. Bookmark the permalink. Kathmandu is quite a sprawling city eh? Any close up pics of it? Yeah it’s quite big! Bigger and busier than I expected. 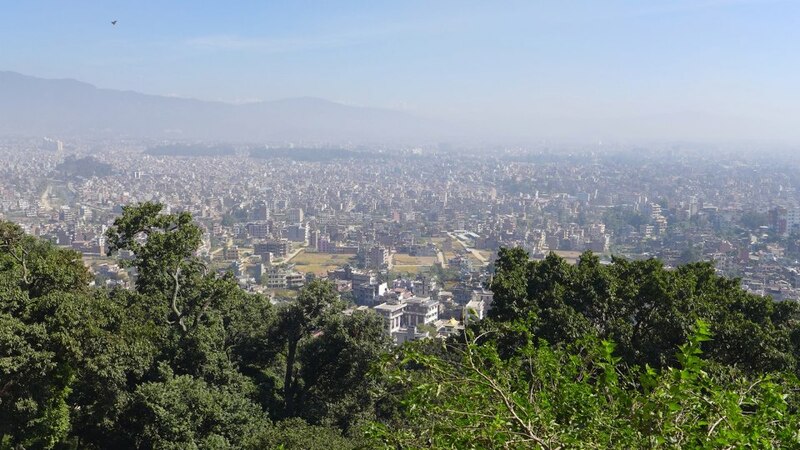 The photo you see is of Kathmandu Valley, which actually consists of 3 sub-cities or districts – Kathmandu, Lalitpur, and Bhaktapur. Hence why it looks so huge… apparently the entire valley covers an area that is almost the size of Singapore!